Mayor Clifford Lee today issued the following press release to clarify any misunderstanding that may have been created in regards to the Upton Farm Property. Mayor Lee would like to assure the Upton Farm Preservation Network and Canada Lands that the position of the City of Charlottetown remains that we would like this area to remain an Open Green Space. It may have been interpreted in the Guardian on April 15, 2008 that a major subdivision or a permanent concert site was under serious consideration. This is clearly not the case. The City of Charlottetown is currently working with representatives of the Upton Farm Preservation Network and Canada Lands in an effort to create a concept plan that is acceptable to all interested parties. When an acceptable concept plan is developed public input would be sought through the public meeting process. It is extremely important to City Council that the current discussions between Canada Lands, the Upton Farm Preservation Network and the City of Charlottetown continue until an acceptable concept is developed. The issues of expanding the water and sewer system in this area and the possibility of a concert taking place in this area should not negatively impact these important discussions. 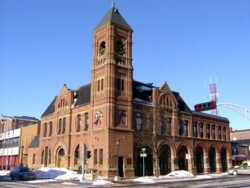 The City of Charlottetown sought approval from Canada Lands to have a concert take place on this property in 2008 as a one time only event. Canada Lands graciously gave its approval only after meetings with representatives of the Upton Farm Preservation Network and the City of Charlottetown. Mayor Lee would like to clearly state that the water and sewer extension is to service the area known as Poplar Island and has no bearing on the Canada Lands properties. He also wants to assure area residents that the City of Charlottetown has approved one concert for this location and should any further consideration be given for future concerts that discussions will take place with all interested parties. This entry was posted on April 20, 2008 at 3:09 pm and is filed under Support from Local Politicians. You can follow any responses to this entry through the RSS 2.0 feed. You can leave a response, or trackback from your own site.